A lot of us grew up watching Lucille Ball and her antics, and there are a lot of young people out there that never really have had an opportunity to know her sheer comic genius. On of my favorite scenes with Lucy was the infamous grape stomping scene, while I can’t post the entire show, I did want to share the scene as found on youtube. Enjoy! Vermont Tarentaise has been made by John Putnam from organic cow’s milk at Thistle Hill Farm in Vermont since July 2002. Based on the Alpage-style cheese Abondance, Tarentaise is fairly firm and aged for at least six months. The flavor is grassy, nutty and buttery; as the wheels age in our caves, the flavor becomes more assertive. Tarentaise was awarded the prestigious honor of “Best Farmstead Cow’s Milk Cheese” at the 25th American Cheese Society Conference and, with over 45% butterfat, makes a perfect melting cheese as well! Medium-bodied, fruity red wines pair well with this cheese – try it with Rich Pinot Noir or Velvety Cabernet Sauvignon. 25th Annual Conference, American Cheese Society’s Winner. I’m always in need of a rather simple recipe that is easy and quick when I have guests coming over that provided me with minimal time in the kitchen and more time to enjoy my guests. 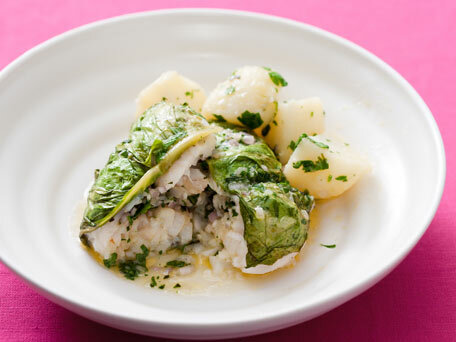 Here’s a simple recipe for white fish that does just that, and pairs well with the softer varieties of red wine such as pinot noir, blue franc, and bolder whites such as chardonnay and pinot gris! Mash together butter, herbs, and shallots. Spread 1 Tbsp butter mixture on bottom of a 1 1/2-quart shallow baking dish. In a pan of steeping water, quickly shock the Large Leaf of Swiss Chard, or other leafy green vegetable just to make it more pliable. Season fish with ½ tsp salt and ¼ tsp pepper Divide remaining butter mixture and spread on fillet, then roll up. Place 1 fillet on large Swiss Chard leafy green vegetable then tuck leaf around fish to enclose fish and place in baking dish. Cover dish tightly with foil and bake until fish is cooked through, about 15 minutes. As always we’re on the lookout for a wine that is a standout at a bargain price point. Crushpad Wine’s Banshee Project is a winery to keep our eyes on for such products. For example, they are producing Rickshaw Pinot Noir out of Sonoma County California sourcing the grapes from pretty renowned vineyards that were (as I understand the story) “extra grapes” that weren’t going to make it to the market. Hence, they got a deal and pass the deal on to us, the consumer! I like to think of it as one of the best wines in an ugly label on the market! Many of the high quality Sonoma Pinot Noirs that are deep dark blackberry with jam and spice retail well above the $40-50 range, but Rickshaw Pinot Noir retails just under $20- half the price of the wines of equal or lesser quality from the very same regions and (in some cases) the same vineyards. Rickshaw is a fun, lip-smacking pinot noir perfect for picnics, sneaking into movie theaters and other such shenanigans. It is a blend made from a couple of sources scattered throughout Sonoma County. The resulting wine has hallmark pinot spice on the nose and fills the mouth with juicy red and blue fruits. Very smooth. We have bottled Rickshaw under screwcap for convenience and quality control. Being a Stelvin Closure, or screw cap bottle I typically would recommend this as a wine to drink sooner than later. And while it is phenomenal straight up today I’m willing to take a gamble and bet this jewel will become even more graceful on the palate in a couple of years with the potential to develop a little silky velvet and an even more nuanced sensation of blackberry jam subtly lit by white pepper on the finish- that is if you’re patient enough to wait knowing that it’s a winner today! April 01, 2011– April Fools! Wines that are not what one may expect from the first glance. There are a tremendous number of wines that have little nuances hidden within that can be rather shocking at first, but with a couple of sips step up for your sipping pleasure! April 08, 2011–Wines of the Southern Rhone. We will celebrate the spring with delights of the Rhone A few grapes being grown in Rhone that shine and are not commonly recognized. Can you tell the difference between a Sauvignon Blanc and a Umi Blanc? Bet you can when we’re done with this program! April 15, 2011- The first Sunset Stroll of the season! We’ll have 2 wineries present and presenting wines for your pleasure, J. Lohre and X Wineries. The gang of Gals from Artists alley will also be with us displaying their art as well. This program is being presented in conjunction with the Blue Ridge Wine and Food Festival that runs April 13-18, 2011. April 22, 2011–Evolution of wine. We will take a stroll through the past and a look at the future through wine. Sampling a wine from the same recipe used in the court of Julius Caeser, wines that are made with little to no refining much as they were thousands of years in the past , and wines that are being made with cutting edge technology to reduce allergen and alcohol levels. A wonderfully delicious taste of history and science blended together! April 29, 2011–Wines of New Zealand and Australia. We’ll take a trip down under and visit with some of our favorite fruits of the southern Hemisphere. There are wines that are not available in every nook and cranny of the world. As our brick and mortar retail shop is located in the very small village of Blowing Rock nestled in the picturesque mountains of North Carolina we have thousands of people come through our doors through the year and discover some unique and hard to locate wines. Our customers asked us to find a way to provide these products to them where they live as they are not widely available in many cases. This initiated our web-store, Christopherswineandcheese.com from a desire and concept to reality. It has become a nightmare over the years to digest state regulations on what can and can’t be shipped into various states… wine can be shipped into most states, fortified wine can be shipped into most of those states as well, beer can’t be shipped anywhere- and there are some states that you can ship only certain products into certain regions. If you ever meet me, you will now know one reason I’ve the gray hair I have. I’m lucky, while North Carolina works off a three tiered distribution system, most of my distributors are good to work with and understand what I am looking and what our shop is about. There are some bad guys in the wholesale distribution world too though, and they would rather there be no shipping of wine in the United States, stripping you of your freedom to acquire products that are not available in your area through them. They have sequestered the help of a member of the US Congress to introduce HR1161; which basically states that no one can challenge any state law that interferes with the commerce of wine and spirits, nor can congress pass any new law leveling the playing field in the future. So, as much as I hate to post a political statement on our site today; I do so with hops that you will locate your Congressional Delegation and explain that you wish to keep your freedom of choosing what Wine Products you wish to buy and from where/who you wish to buy them. Should this resolution pass and eventually come into law, there will be many small wine merchants, like myself, who will not only not be able to provide you with a service, but probably will not be able to survive without that ability to ship you wines that you cannot find in your own backyard. Here’s the easiest way you can locate and contact your representative. Thank you for listening to me rant a bit today. Hummus is often considered bland and pasty, primarily because it isn’t seasoned and flavored by the preparer properly. 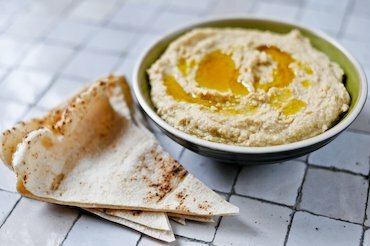 I like spice and flavors to jump out of a food and attack my palate and blend with my wine, so I want to share a tasty rendition of hummus the way I think it should be done. With this recipe, think Pinot Nero, Mencia, Shiraz, or any other nice drinkable-sipping red wine. If the day is warm and you wnat to think chilled white wine I recommend your steering towards Riesling, or Muscat Canelli wines. Bon Appitite! 2 quarts of chicken broth (homemade will have more flavor, but the store brand works just fine! Rinse the dried chickpeas in a sieve removing and dark, or undesirable beans. Then place the chickpeas into a pressure cooker pot along with everything listed except the lemon juice and olive oil. If there is not enough broth to cover the chick peas, add enough water to bring the liquid level above the chick peas. Bring the chickpeas to a high boil in the pressure pot cooking them for 10 minutes once the weight starts to whistle on the pressure cooker. Once the pot has cooled to the point you can safely open the pressure cooker, drain the chickpeas and place in a food processor. Grind the chickpeas until they reach the consistency you like your hummus and add the lemon juice and olive oil; mixing thoroughly. If you like sun dried tomatoes, those can be added in the food processor, as can be dill, or any other flavorful taste you can think of!